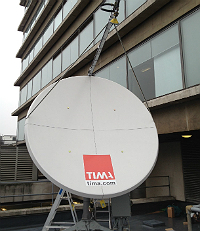 TIMA chooses Eutelsat for SNG operations. satellite to serve the growing market for satellite news gathering (SNG) across Europe, the Middle East and Africa, and reporting from the studios of its central London Headquarters. With offices in London, Paris and Washington DC as well as operations in the Middle East, TIMA provides a range of cutting-edge services for the international news broadcast industry, including production facilities, content production and events coverage. The new satellite capacity will boost TIMA’s ability to serve news teams covering events of global interest in the coming months including the Oscar Pistorius trial and the visit to the Holy Land by Pope Francis, as well as breaking news stories. “Satellite is a vital platform for high quality content distribution, especially in an age of HD transmission. It’s reliable, high quality and still provides the easiest and quickest way to distribute content to a wide range of customers around the world. We're looking forward to exciting times in collaboration with Eutelsat,” said Alla Salehian, CEO of TIMA. “We are delighted that the performance of EUTELSAT 10A matches the expectations of TIMA and to forge a new relationship with a point of reference for immediate distribution of video content for the international news broadcast industry ,” commented Nick Daly, Managing Director of Eutelsat UK.